Units should be measured to allow approximately 1mm clearance all round where the rebate depth is 7mm. Allowance should be made where the opening is not perfectly rectangular. Where the rebate depth is in excess of 7mm, additional clearance can be allowed, but always ensuring that the sight line of the perimeter seal is below the sight line of the back rebate. All rebates should be clean and clear of minor obstructions and brushed clean and primed. The rebate should be bedded with a non hardening compound (butyl) to provide a bed between the back rebate and glass of approximately 2mm. The unit should be placed into bedded opening and pressed equally around the perimeter until the 2mm back bed is obtained. However whilst the back bedding should be a non hardening compound such as butyl commonly used, silicone is sometimes used but mainly on metal windows. The use of a sprigging gun ensures that the diamond sprig is less than 1mm from glass, and prevents any scratches to glass surface. The sprig should be set at 150mm centres or as necessary for small panes. The fore putty should be carried out with Linseed Oil Putty or Steel Sash Putty, as BS6262 to the rebate depth sight line or just below to allow for paint finish line on putty. Putty should not be painted for at least seven days. The minimum fore putty on rebate width should be not less than 6mm. The function of foreputty is to protect the frame by shedding the water from the frame. It is important that the fore putty should be brushed with a fine duster brush to ensure that there is a good seal on the putty against the glass. All rebates should be clean and clear of obstructions, brushed clean and primed. The rebate should be bedded with non hardening compound (Butyl) to provide a bed of approximately 2mm between the glass and back rebate. The unit should be placed against the bedded back rebate and pressed equally around the perimeter until the 2mm back bed is obtained and only trimmed flush when glazing has been completed. The rebate width should then be bedded with non hardening compound to obtain a very thin bedding not exceeding 2mm or gun grade which has a much thinner consistency. The timber bead which should be angled to provide a water shed and should be bedded against the glass by applying the compound to the front edge of the bead in sufficient quantity to prevent voids when fitted against the glass and excess trimmed, matching the water shed angle of the bead. The finished height of the bead should be 2mm below the back rebate height to allow the painter to paint over the trimmed water shed angle of the compound to match the angled bead. The paint finish is important to provide protection against the rain and sun and the compound should be allowed to cure for at least 7 days before painting. Where timber beads are to be pinned into the rebate where the rebate width is particularly narrow the beads should be pre-drilled with very fine drill. Glazing Slimlite Double Glazed Units to existing metal windows, after removing single glazing, and priming with metal primer. The existing single glazing was held in place by metal clips fitted into metal holes in the rebate. As the holes are not re-usable, the best method of glazing is to bed the back rebate or rebate height with approximately a 2mm bed of silicone and the unit pressed back against the silicone which when cured in approximately a day or two will hold the glass permanently in place. The rebate width can now be foreputted with a steel sash putty to finish approximately 2mm below sight line to allow painting to finish to sight line. Alternatively use Colourglaze, which goes off within hours and allows you to paint on the same day. It is important that the foreputty should be brushed with a fine duster brush to ensure that there is good seal on the putty against the glass. Can be obtained from any Company selling miscellaneous glazing tools. All units have a hydro phobic self-cleaning coating to the external pane. When cleaning use hot soapy water and take care not to let any grit get onto the cloth. This is caused by failure of the glazing method which must protect the unit seal from the ingress of water or moisture. All double glazing sealants used in the manufacture of double glazing units have a moisture vapour transmission rate when exposed to water or moisture, which will cause misting or breakdown eventually over a period of time. Where units are foreputtied, the putty must be painted, and on to the glass, to provide a seal to protect the putty from moisture ingress. Foreputty should be left for 7 to 10 days before painting and within 28 days. Similarly when glazed with beads and non hardening compound, paint or protective coating should be applied over the bead and on to the glass. Where timber preservative has been used, Manufacturer's instructions should be followed to prevent reaction with glazing compound. All Slimlite Ultra Clear Self Cleaning Units are edge taped with a strong adhesive aluminium foil which helps to avoid damage during handling, but most importantly provides some extra protection should glazing failure occur allowing ingress of water or moisture. 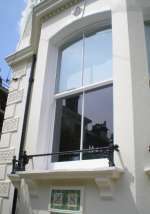 It is recommended that timber windows should be painted every five years Inland areas and three years Coastal areas. However it is recommended that the paint protection of the glazing including the overlap on to the face of the glass, should be repainted every three years to maintain the required protection particularly with putty fronting as a minimum. However more frequent 'spot painting' may be necessary to maintain the required standard of protection.